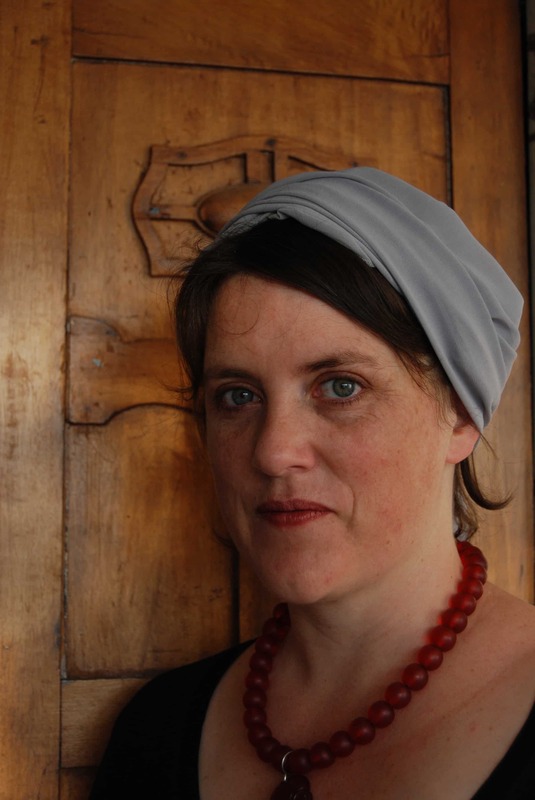 I’ve been online stalking Sarah Davis for some time now – in the nicest possible way! 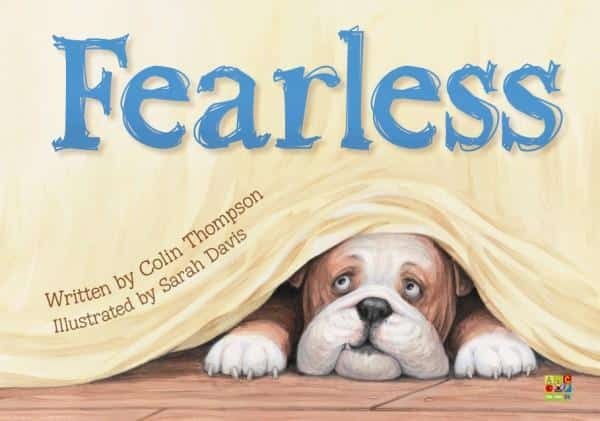 I have adored her illustrations ever since I purchased ‘Fearless’ some years ago now. 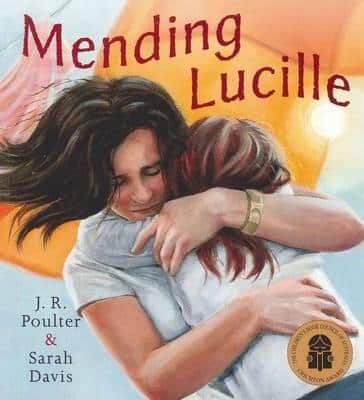 I loved it so much that as soon as I finished it I Googled ‘Sarah Davis Illustrator’, located an email and emailed her. I’m happy to say that I got a lovely reply to my over enthusiastic email! 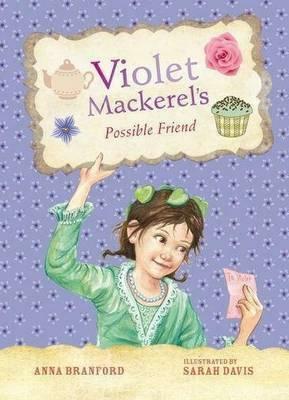 Rather chuffed that I’ve now got her featured here on ‘Children’s Books Daily’. 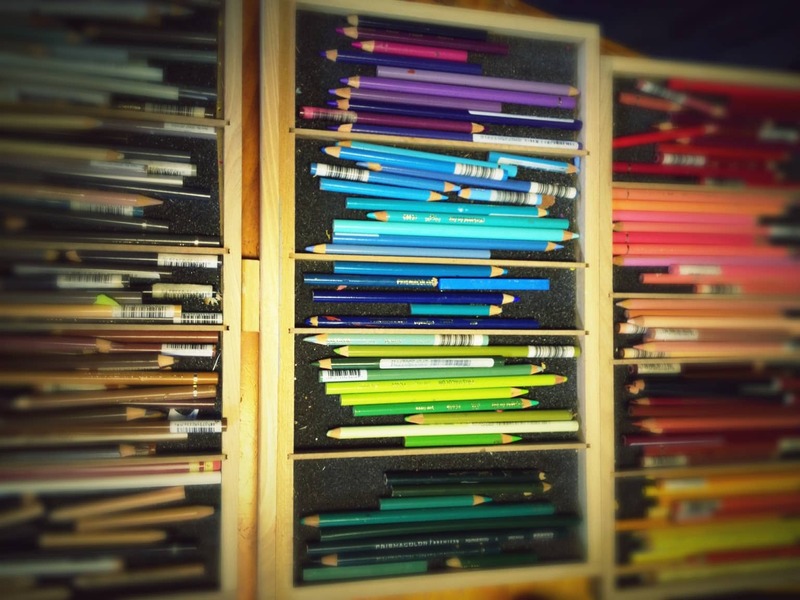 Ummm… which one!? I always seem to have about a million books on the go at once, which is a little confusing for someone like me, who can’t really reliably remember whether socks are worn on the hands or as earwarmers. 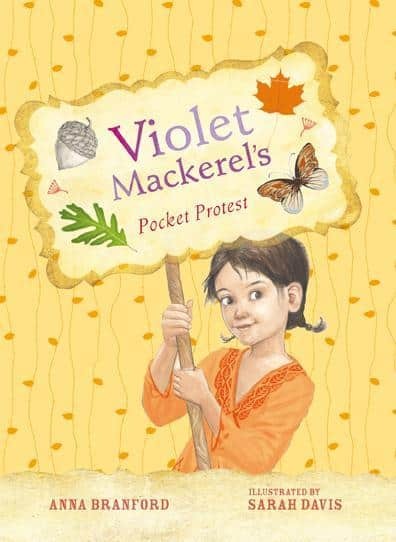 The 6th Violet Mackerel book (Violet Mackerel’s Pocket Protest, written by Anna Branford, published by Walker Books Australia) is due to hit the shelves very soon, and I’ve just finished a completely loony book for the fabulous Gecko Press. 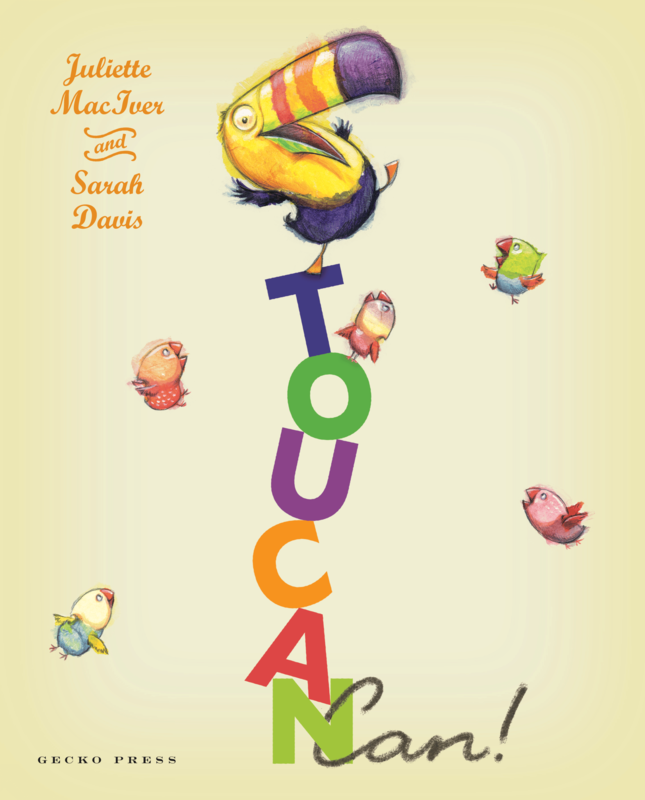 It’s called Toucan Can, and was written by the irrepressibly bouncy Juliette MacIver. It’s wacky, and I used a very loose, lively colourful style which was a lot of fun to do. I blogged about it here. Also, I’m currently working on the third Marmaduke Duck book, in which he sets off for an adventure on the high seas (also by Juliette) and the third Fearless book, in which dear old poor old stupid old Fearless becomes a Dad (written, of course, by Colin Thompson). I’m also very excited about collaborating on a book with my son Finn – he’s written a truly beautiful book, and we’ve had expressions of interest from a few publishers. AND I have a couple of books of my own on the go! 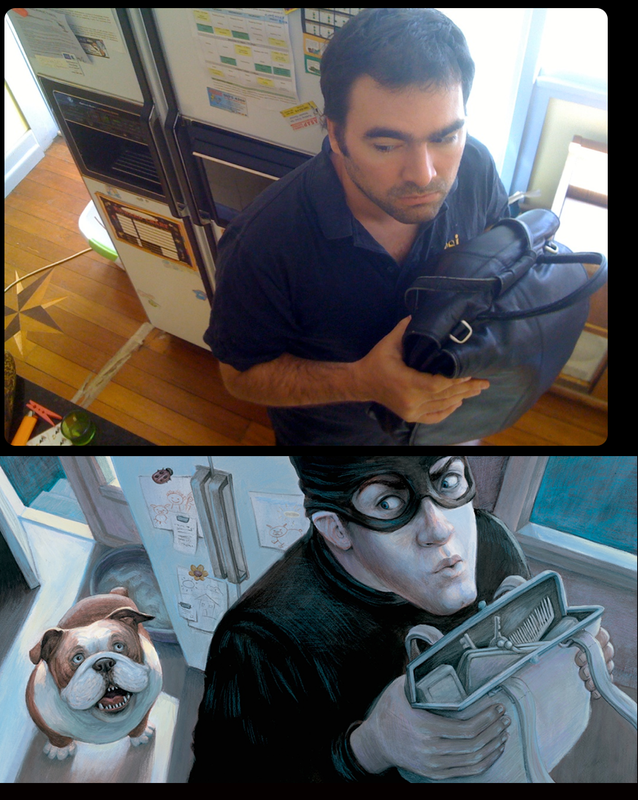 It’s a bit of a clichéd response, I know, but really, I think I’ve been illustrating my whole life. A couple of weeks ago my mum gave me all my old drawings and school projects that she’d kept, and it was interesting to see how I tried to use elaborate illustrations to cover up gaps in my (woefully inadequate) research. For instance, the “facts” I gathered for my project on seagulls (aged 7) were: “When the red-billed seagull flies you see more white than black. When the black-billed seagull flies you see more black than white. 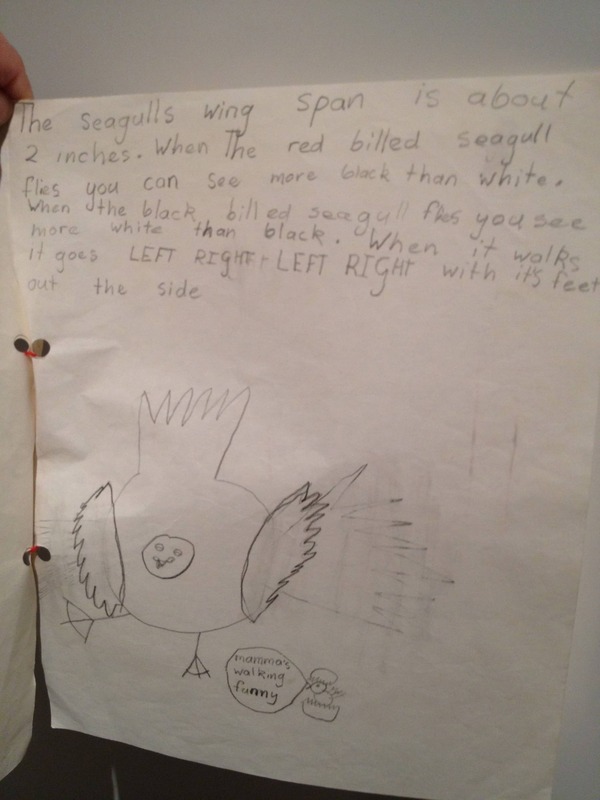 When it walks it goes left right left right with its legs sticking out the sides.” But I tried to compensate for the fact that I’d totally made up all my seagull info by drawing a funny cartoon. If I’d been smart, I should have pursued illustration right out of high school, but instead I more or less gave up drawing and did a literature degree, and taught English and creative writing in High schools for a few years. 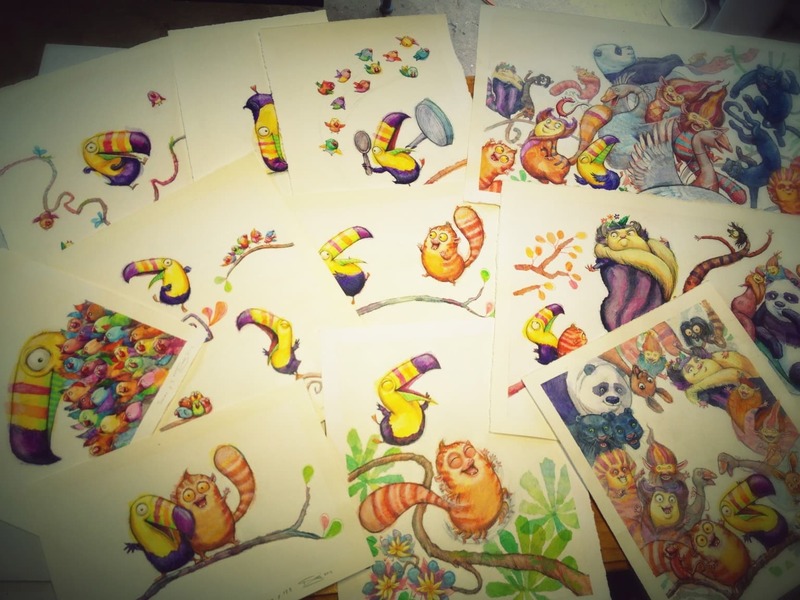 It wasn’t until 2005, after we moved to Sydney from NZ, and I’d taken time off teaching because the kids were really little, that I started drawing again. I started off getting small jobs via freelance sites on the internet, and built up a portfolio that way, and then got my first book contract in 2008 after joining SCBWI (Society for Children’s Book Writers and Illustrators). Now I’m totally ruined for any other career – I’ll never have a real job again. I usually get up about 6.30 and hang out with the kids before school, then when they’ve left, I tidy up a bit and get down to work about 9. Then I have until they get home at 3 ish to fit everything in, so I’m head down, glued to my chair, usually working on about 5 different projects at once. Sometimes I forget to eat. 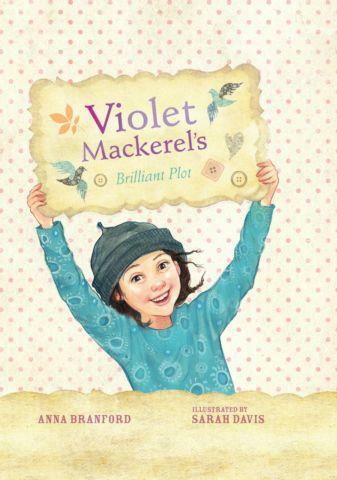 As well as the books, I also do commercial and educational illustration jobs, because actually (shhhh, don’t say this too loudly…..) you hardly earn anything from writing and illustrating children’s books. So to pay the bills I have to do other jobs as well. Plus there’s also all the boring admin that goes along with running a business – tax, invoicing, answering emails, blah blah blah. After the kids get home at 3 we do cosy homey stuff, and then they go to bed about 8.30 and I read to them, and I start work again at about 9 pm and go for as long as I can stay awake. Sometimes I stay up all night! Tragically, at the moment I don’t really have one! 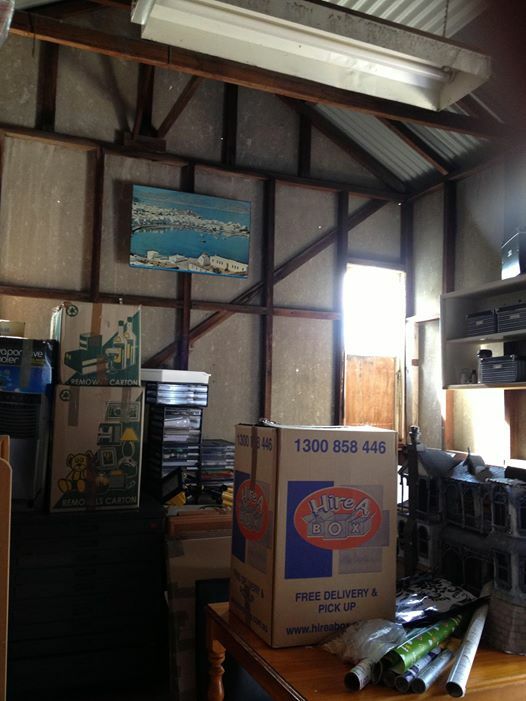 We’ve just moved house, and have a lovely place on the Central Coast with a view of the sea, and there’s a big garage that is just begging to be turned into a studio – but I haven’t had time to do anything about it! It’s still all bare joists and concrete floors and dust, and all my studio equipment is still packed in boxes… but one day, it’s going to be fabulous. In the meantime, I have my graphics tablet and computer set up in my bedroom, and I do the messy painting bits in the dusty garage… but it’s a bit too cold to work out there in the depths of winter, so I’m not sure what to do over the next couple of weeks. I’ll probably colonise the coffee table or something. If you love doing either or both of those things, don’t forget that you love it, and don’t stop doing that thing you love. It’s amazing how many opportunities there are out there to make a living from it, once you start looking, and if you can find a way to make a career out of something that feeds your soul and feels like fun, you’ll never ever have a bad day at work. Also, the ONLY way to get really good at something, is just to do it A WHOLE LOT. There’s no shortcut. Oh, this is an impossible question! Asking me to pick just one is like asking me which one of my children is my favourite. The books that have stuck with me from childhood are The Lord of the Rings, The Sam Pig Storybook, The Brothers Lionheart, The Dark Is Rising series, the Wizard of Earthsea, any of Tove Jansson’s Moomintroll books, Winnie the Pooh. My recent favourite picture book is Battle Bunny, by Mac Barnett, Jon Sczieska and Matthew Myers. They’ve written a saccharine tale of cutesy animals called Birthday Bunny, and then reworked it as if an 8 year old has gone through with a pencil and made the story a lot more exciting! It’s a hilarious and fabulous idea, and I wish I’d thought of it. You can read more about it here and purchase it by clicking on the cover below. Maybe a creator of books for old people? Well, to be honest, chocolate! But because my job also involves hours of sitting down every day, I’ve come to realise that also eating a bunch of chocolate is a really bad idea… it makes me grumpy and sick, and my trousers mysteriously get tighter and tighter. So now I try and stick to eating healthy things like fruit that give me lots of energy and keep my head clear. I can’t listen to anything if I’m trying to think and coming up with ideas. Even birds tweeting annoy the heck out of me. But when I’m working on the final paintings, a herd of buffalo could stampede through the studio, and I’d hardly flinch. So at that point I listen to lots of audio books and podcasts, or music if I need energy. 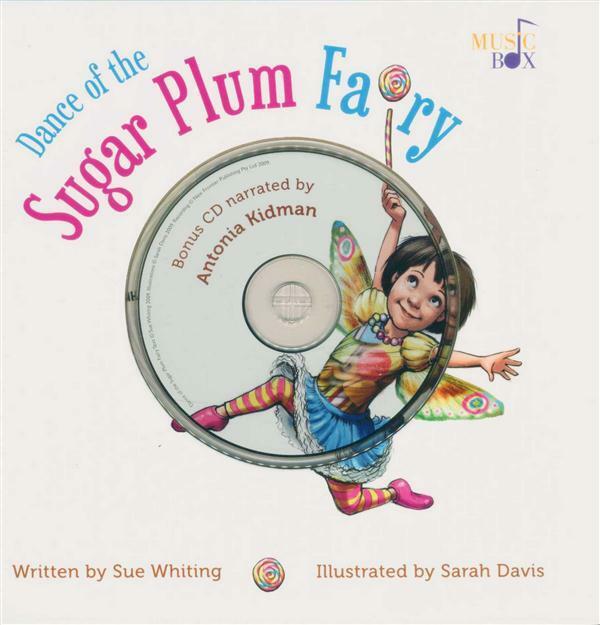 Funnily enough, each book needs different music. Toucan Can has lots of crazy dancing in it so I listened to masses of Bollywood hits for that one. Fun! I’m usually doing my books quite quickly, so don’t have a lot of time to include as many cunning insider jokes as I would like to, but inevitably a lot of my life creeps in anyway. For one thing, I have fabulous family and friends who are all very long-suffering and cooperative about modelling for me (I’ve trained them well!) So my youngest daughter Zoe was the model for the little girl in Mending Lucille, my Sugar Plum Fairy was based on my eldest daughter Nikau, my bloke Dave modelled for the robber in Fearless (Although I changed his face a lot! He’s better looking in real life.) 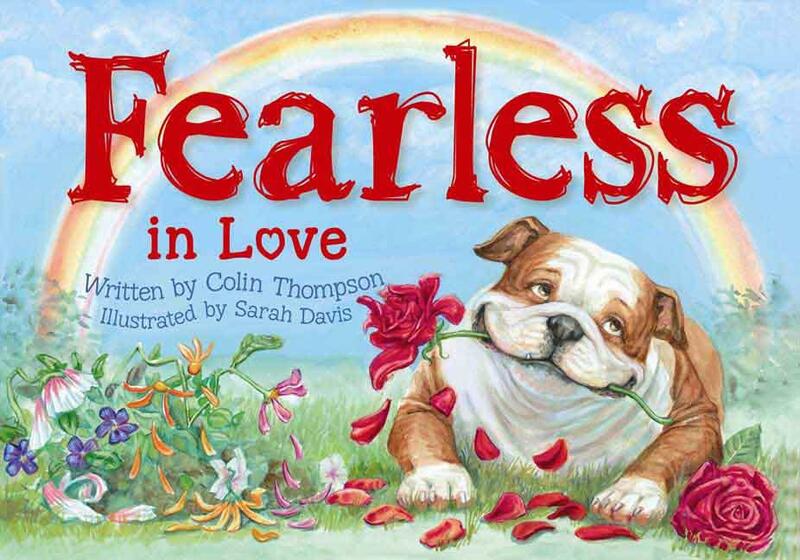 When I was working on Fearless, I was thinking of the sooky boxer dog that I had as a child – his name was Pickles. 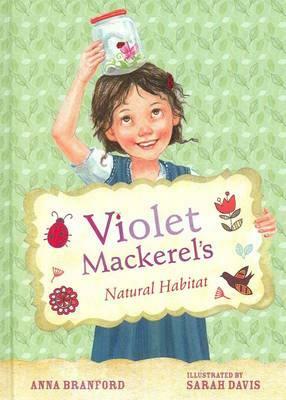 And, coolest of all, my daughters collaborated with me on the Violet Mackerel books. 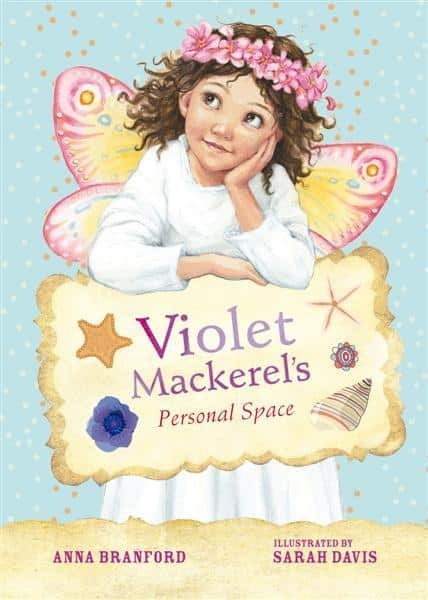 Zoe does all Violet’s little doodles, and Nikau does her handwritten notes. I think, when it comes right down to it, almost all the problems in the world would disappear if people had more empathy with each other, and with other species. So I would wish for a massive, universal empathy infusion for humanity. Sarah THANK YOU for joining us here! 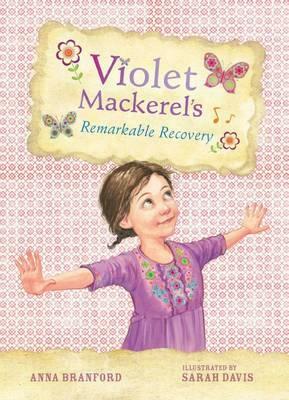 You can purchase Sarah Davis’ books by clicking on the covers below, which are a selection of her available titles. 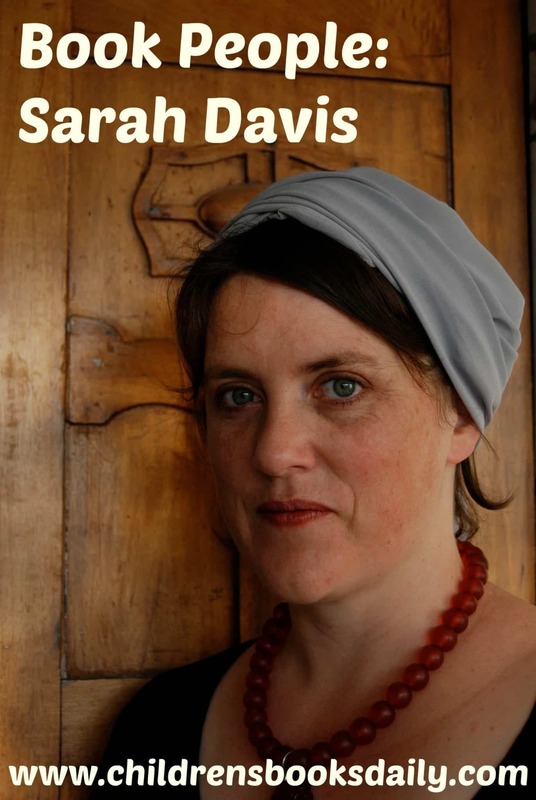 I was just wondering if you could please pass me on Sarah Davis’ email address?? Have a school project and would be very handy to get some answers from her! Hi Melina, I contacted her on Facebook, or through her website. She’s super quick on both.